The Bull was never a proper boozer at the best of times, it could never generate the right atmosphere around such small bar, you would need to visit The Magpie in New Street for that. The latest Bull incarnation is one which is becoming popular within the City, lunchtimes are focused on good food and small drinks and the evenings a good deal more drinking. The recently opened Fullers pub, The Vintry is a good example of this, but back to The Bull, the small bar is centered at the back wall, there is some room to stand but it's not big. The current popular favourite of brown is used on the seating and floor. There is an extensive menu, from a full English breakfast (£6.50) to coffees and sweets as well as wine list, all menu items are subject to a 12.5% mandatory addition. Being small, the table layout is fine for lunchtime diners, but makes drinking in the evening limited on space. 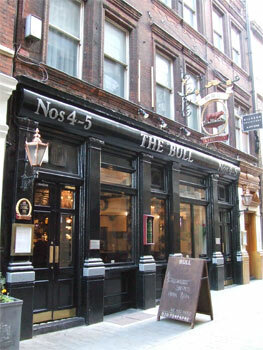 But The Bull is probably more suited to being a restaurant type bar than a pub.